Learn how to unravel the mysteries of healthy eating and living with scrumptious recipes, healthy insights, and other tidbits of knowledge and fun. Core medium apple. Gently scoop out most of insides. Place scooped-out apple into mixing bowl. In mixing bowl, place remaining ingredients. Place ingredients into cored apple. Put baking sheet into preheated oven. Bake for 20 minutes, until knife easily slides through the apple. Serve with a dollop of whipped cream or ice cream. For ease of use, utilize a freezer bag and place the fruit in a single layer. Date label. Frozen fruit thickens smoothies, shakes, protein drinks, and other beverages. Puree some fruit. Pour the mixture into ice cube trays. Squeeze a fresh lemon or lime into ice cube tray molds. Remove a cube and use as desired. Place one into a glass of water. Follow directions for fruit cubes. Place in chilled glass and enjoy as a beverage. Make a Bloody Mary by adding tomato cube to vodka. Use as seasoning agent in stir fries, soups, dips, and spreads. Place nuts into an airtight container and freeze. Remove these nuts and enjoy as a snack, yogurt or ice cream topping, or other delight. You will notice an instant relief when sipping beverages from a chilled glass. Serving salads in chilled bowls or serving dishes offers another option that cannot be beat. Let your imagination run wild. These are just a few ways to reduce your internal temperatures and tolerate warmer climates. Yesterday was Farmer's Market day. Upon looking over a variety of scrumptious-looking fresh produce, one vendor had some remarkable broccoli for sale. 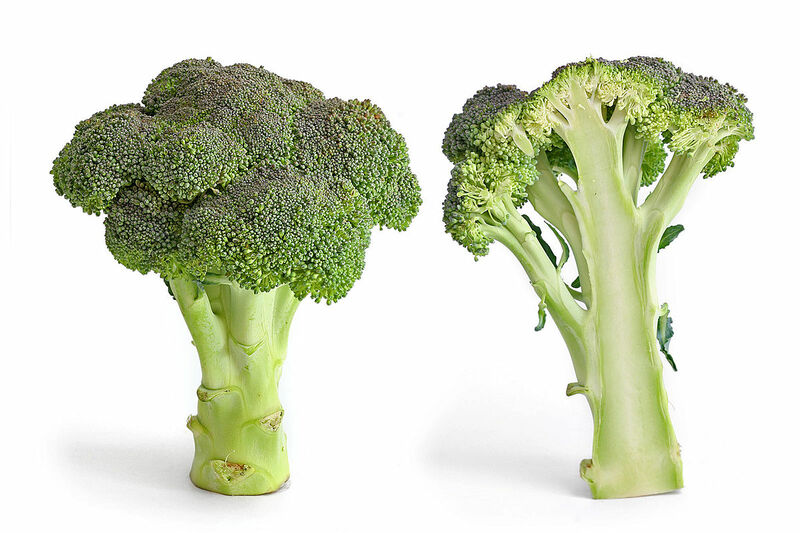 Store-bought broccoli has nothing over this organic, local farm grown jewel. The bunch was asymmetrical. It was a beautiful shade of dark green. There were no blemishes or discolorations. The stalk was very fresh and HUGE. All in all, it was quite a pleasant sight to see. There was no smell of chemicals. While checking out the broccoli, I picked up one bunch and was amazed at its natural beauty. “This needs to be a wedding bouquet”, was my comment to another veggie-lovin' customer. Wouldn't that be cool? An edible wedding bouquet. Instead of throwing away the typical flowers, you could take a picture of the nutrient-rich bouquet. Then, steam it up for your dinner. That's what I call recycling. Hi everyone! Autumn harvest is my favorite time of the year due to the abundance of squash. Squash are a misunderstood breed, in my opinion. If you are like me, you were introduced to them as a kid through those frozen blocks that melted into mush. There wa nothing tasty nor delightful about them at all. No wonder many people still don't like these wonderfully nutritious gems. Here is a recipe I developed that highlights the delicate and marvelous taste of spaghetti squash. 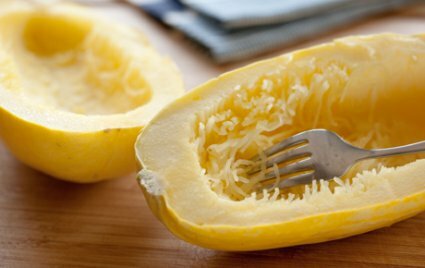 When cooked, this squash resembles spaghetti strands, hence its name. I highly recommend steaming it to keep as many nutrients as possible. Steaming also preserves the unique texture and taste more than other cooking methods. I find that to be true, anyways. I highly recommend either getting an electric knife or a very sharp serrated knife to cut this squash up. This suggestion actually applies to all squash types. To say you will get a good arm workout when preparing this tasty food category is an understatement. Place 1” of water into the bottom of a dutch oven on stove top. Put steamer basket into pan. Turn heat to medium level. Place squash and veggies into steamer. Cover and cook for about 15 minutes. Test for doneness by poking veggies with a knife or fork. Let cool until veggie temperature is easy to handle. Remove squash and place onto cutting board. Find a 9”x12” baking dish or other appropriate serving dish. Remove squash flesh from peel with a spoon or fork. Place flesh into serving vessel. Add veggies, beans, and spices to the cooked squash. Taste. Add more spices, if desired. Serve warm as a side or main dish. Store leftovers in an airtight container in your refrigerator. Happy Thanksgiving everyone and ENJOY! 1. About those carrot sticks. Avoid them. Anyone who puts carrots on a holiday buffet table knows nothing of the Christmas spirit. In fact if you see carrots, leave immediately. Go next door, where they're serving rum balls. 2. Drink as much eggnog as you can. And quickly. Like fine single-malt scotch, it's rare. In fact, it's even rarer than single-malt scotch. You can't find it any other time of year but now. So drink up! Who cares that it has 10,000 calories in every sip? It's not as if you're going to turn into an eggnogaholic or something. It's a treat. Enjoy it. Have one for me. Have two. It's later then you think. It's Christmas! 3. If something comes with gravy, use it. That's the whole point of gravy. Gravy does not stand alone. Pour it on. Make a volcano out of your mashed potatoes. Fill it with gravy. Use enough of it to have the gravy flowing like lava out of any active volcano. Eat the volcano. Repeat. 5. Do not have a snack before going to a party in an effort to control your eating. The whole point of going to a Christmas party is to eat other peoples food for free. Lots of it. Hello? Remember college? 6. Under no circumstances should you exercise between now and New Years, You can do that in January when you have nothing else to do. This is the time for long naps, which you'll need after circling the buffet table while carrying a 10-pound plate of food and that vat of eggnog. 7. If you come across something really good at a buffet table, like frosted Christmas cookies in the shape and size of Santa, do this: Position yourself near them, and don't budge. Have as many as you can before becoming the center of attention. They're like a beautiful pair of shoes. You can't leave them behind. You're not going to see them again. 8. Same for pies. Apple. Pumpkin. Mincemeat. Have a slice of each. Or, if you don't like mincemeat, have two apples and one pumpkin. Always have three. When else do you get to have more than one dessert? Labor Day ? 9. Did someone mention fruitcake? Granted, it's loaded with the mandatory celebratory calories, but avoid it at all cost. I mean have some standards, mate. 10. And one final tip: If you don't feel terrible when you leave the party or get up from the table, you haven't been paying attention. Reread tips. Start over. But hurry! Cookieless January is just around the corner. Here's a personal note of mine....remember to bring a pair of stretch pants with you to any celebration. They will likely come in very handy! There seems to be a concensus that changing unhealthy habits into healthy ones is difficult. It may take a little more patience and insight than what you are used to, but you can do it. Following a "heart healthy" diet and lifestyle is really nothing more than eating a well-balanced, nutritious meal plan that nourishes with few calories and becoming more physically active. Here are some pointers to incorporate into your daily routine. Play with animals, get a pet. Have you ever thought about using green tea as other than a refreshing, healthy beverage? Here's some insight to show its versatility. My students LOVEwhen I prepare this dish in class. Enjoy! There are a variety of ways to use green tea. Green tea has been used in holistic remedies for centuries. The high level of antioxidants can benefit your immune system, your eyes, your skin and your overall health. In addition to drinking iced or hot green tea, try using it in your cooking. Here's an easy way to get extra nourishment into your diet: Steam with it. How's that? Place some fish onto the steamer. This recipe works especially well with trout, mackerel, mahi mahi (dolphin fish), or other white fishes. Cover the pan. Turn on your stove top to medium high. Steam your fish for about 10 minutes, til tender. Poke with a fork to test for doneness. Your fish should easily flake when it is done. Turn heat off and remove pan from burner. Remove your fish and enjoy! Started eating natural foods as a kid by helping my dad with our food garden. Also grew vine fruits. Remember my dismay at buying raspberries in the marketplace and having to take out a loan to buy them. (expensive) I am the proud author of a natural foods cookbook series on the subjects of grains, fruit sweeteners, soyfoods, baby foods, organic foods and lowfat cooking. I am responsible for developing recipes for an organic food enterprise. Along with the above, I have taught cooking classes to help others learn the joys of cooking and eating a healthy meal plan. My love of writing and healthy eating has resulted in my writing published articles, ezines, newsletter contributions and ebooks.